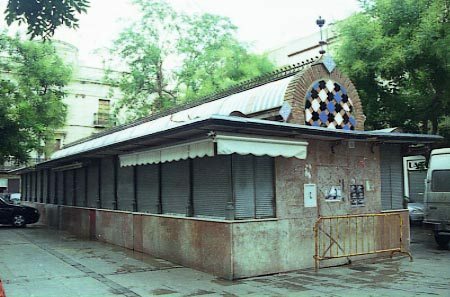 That small food market is a long building located in the center of a square. 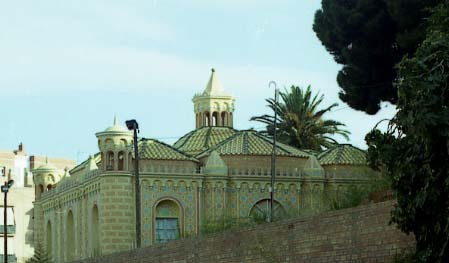 The initial project to build it, was made by the architect Emili Cabanyes in 1891. In 1893, Josep Puig i Cadafalch reformed the roof with new ceramic and forged iron ornamentation. Visits are more interesting when the market is open. Building projected by the architect and mestre d’obres – building master – Jeroni Boada and built around 1870. Recently restored, the building has some Arabic elements and the façade show a big fantasy. In each corner it is a round turret with columns supporting a roof in Arabic tiles. The house is also covered by different roofs and the ensemble is toped by a dome with a four square belvedere. 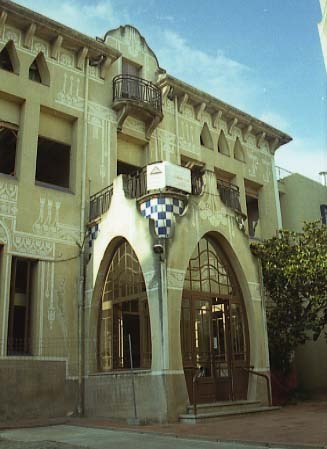 In fact this building was built before the Art Nouveau period in Catalonia, but it show some of the elements incorporated later by this style. 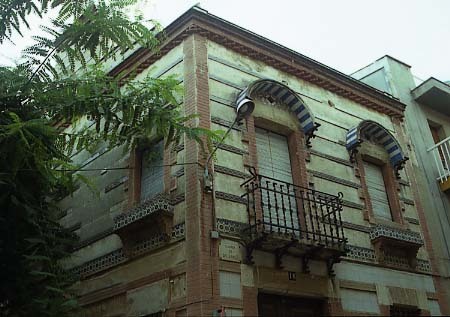 Built in 1894 following a project of Josep Puig i Cadafalch, that house is one of the first to show the genius of that Art Nouveau architect. The building is crowned by neo-gothic sculptures attributed to Eusebi Arnau The façade show also an iron forged balustrade on balcony. 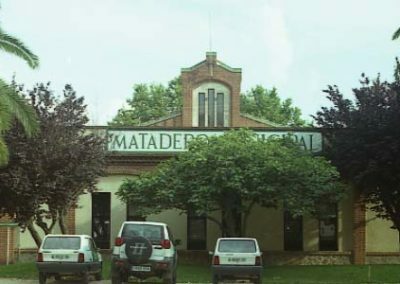 The façade is also decorated with flowers and vegetal elements over an imitation of bricks. Visits are not allowed to the interior. The architect of that building is unknown. 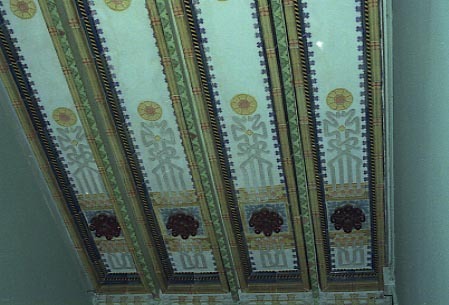 Nevertheless the house has in its interior some Art Nouveau elements. The exterior decoration under the roof remember the Lombard Romanesque style. 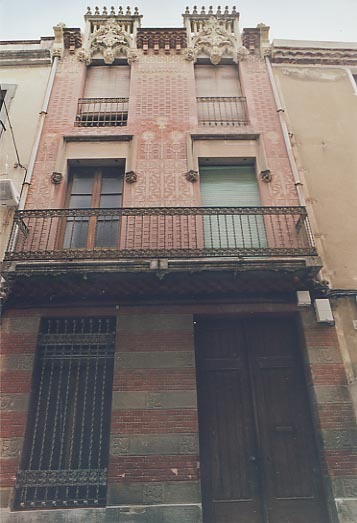 That is probably the first house designed by Josep Puig i Cadafalch the year he was graduate as architect in 1891. 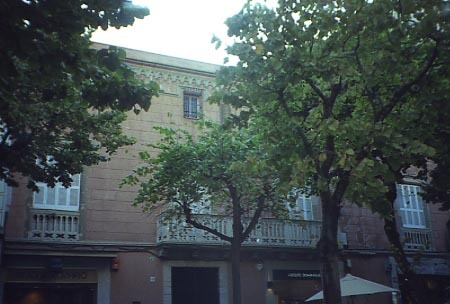 This is a simple building designed to be rented, with two levels and a narrow courtyard in the back. The most interesting part is the ceramic decoration specially over the openings on first floor. The first owner was the surgeon Ernest de Sisternes i Bruguera, also musicien and composer. 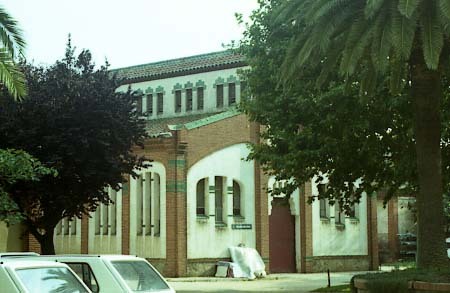 That ensemble of buildings projected by the architect Melcior de Palau i Simon in 1914 was designed as a municipal slaughter house. The ensemble has three aisles linked by porches, yards, a warden house and a water elevated reservoir, all them built in Art Nouveau style. This is an interesting example of industrial Art Nouveau, and is at present used as municipal depot administration premises. The aisles design is simple with columns made in brick, walls in stucco with windows carefully designed showing some ceramic decoration. The enclosure in forged iron is very interesting specially around the main gate. 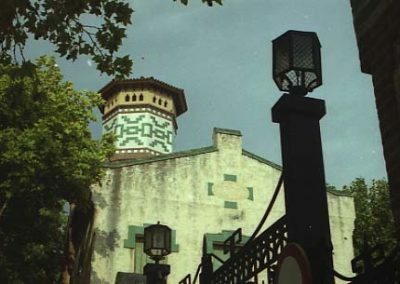 The octagonal elevated reservoir is also decorated with ceramic designs and on the top with series of three windows made in brick in each side, in total twenty four windows all covered by a roof in Arabic tiles. Because the mentioned use of this buildings as municipal depot premises, visits are not allowed. The building of Mataró Municipality is older than Art Nouveau period, but the roof of Sessions Hall was designed by Puig i Cadafalch in 1893, when that architect was the municipal architect of Mataró. That roof is adorned with edgings and different Catalonia coat of arms. 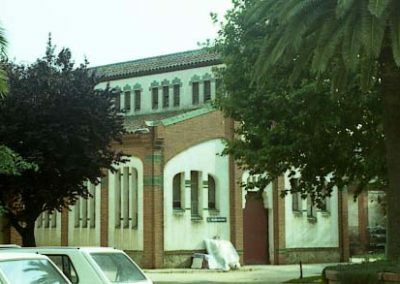 Building projected as a children school by the architect Eduard Ferrés i Puig in 1906 and finished in 1912. This beautiful building has three floors and is used at present as a third age residence. The decoration in ceramic and forged iron is typical of Art Nouveau. The graffito’s on outside walls encircling the windows show a big originality out of the standard Modernism shapes. The roof over-flow the walls with a gable-end supported by decorated brackets.